As spring begins, our theme was: Eggs. Question of the Week: What kind of creatures lay eggs? Challenge: Can you drop a hard-boiled egg from a height without cracking the shell? Discovery Activity: Observe animals that come from eggs – we had a display area with a leopard gecko and crickets. This is a NO TOUCH display. 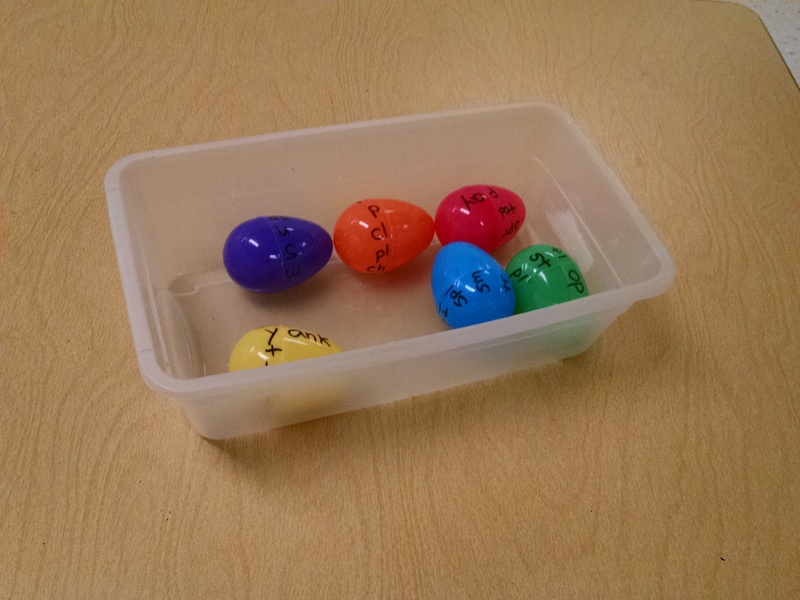 During opening circle, we tested one or two containers with hard-boiled eggs. Test at one foot, then two foot, then three feet, and so on. Do the eggs survive without cracking? Then they tinker more, inventing new containers. During closing circle, we tested with hard-boiled eggs. We had planned to take the best container and test with raw egg, even trying dropping it off some stairs, but we ran out of time. Big motor play: Egg Roll Race. http://littlebinsforlittlehands.com/plastic-easter-egg-races-exploring-ramps-gravity-motion-saturday-science/ Using cardboard “gutters”, roll a ball down the gutter, or roll an egg down, roll “wobbly eggs” down. Which rolls furthest? Which rolls smoothest? In the big motor area, we also put out spoons for a “carry the egg in a spoon” game. Art Process: Gelatin eggs. 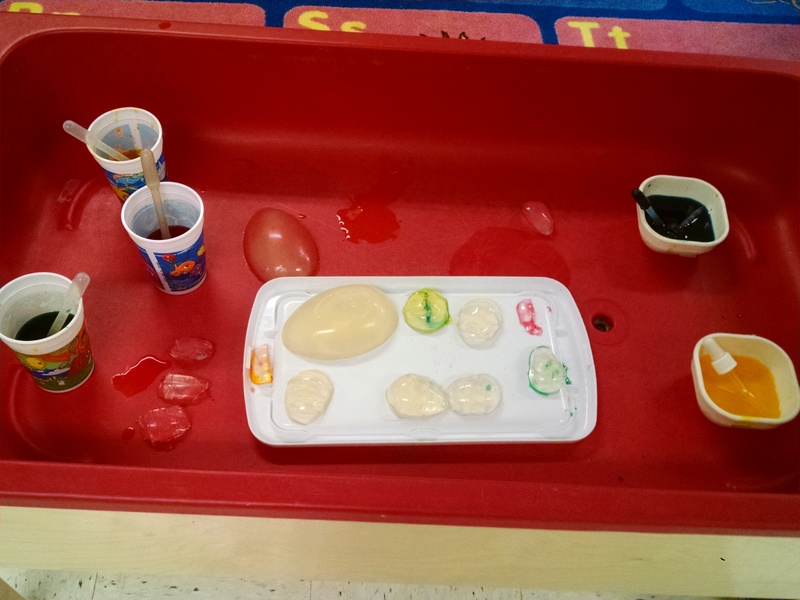 Put in a tub or sensory bin: egg-shaped clear gelatin, pipettes, liquid water color. (http://www.two-daloo.com/sensory-art-play-colorful-gelatin-castles/ and http://myiearlychildhoodreflections.blogspot.com/2012/01/why-is-there-gelatin-in-sensory-table.html) Kids insert the pipette to make a hole, pull it out a little, then squirt in color. Art project: Make egg shaker instruments. Put out plastic eggs. Dried beans to fill with, Sharpies to decorate with, and tape to seal them closed. Literacy skills: We made word family plastic eggs – http://mamateaches.com/word-family-eggs/. We had meant to put out a tray of salt or flour for writing letters in so they could practice copying the words that they saw (www.playdoughtoplato.com/word-family-eggs/). We’ll definitely do that next time, as it will make it a more engaging activity. 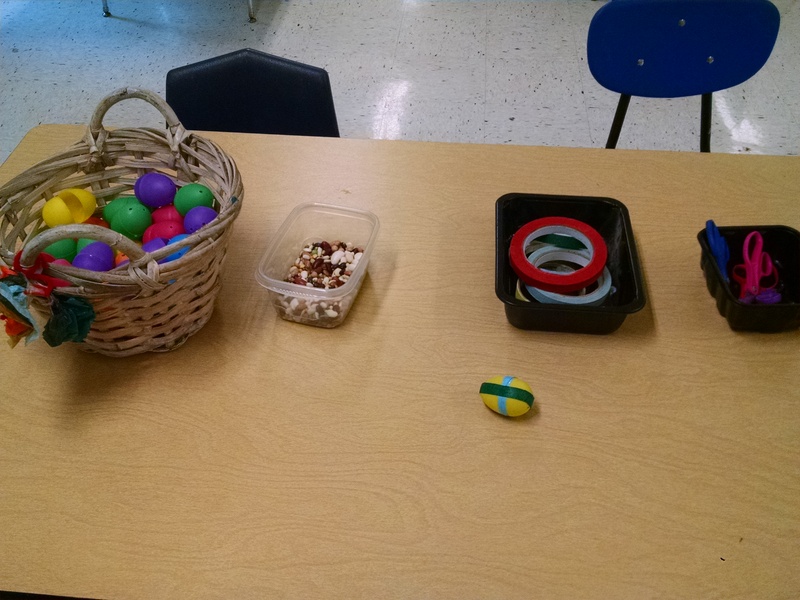 Imaginative Play: We had baskets shaped like nests, hardboiled eggs (chicken and quail) and bird toys. We set the book An Egg Is Quiet with them, and hung a poster comparing how big the eggs are for various species. 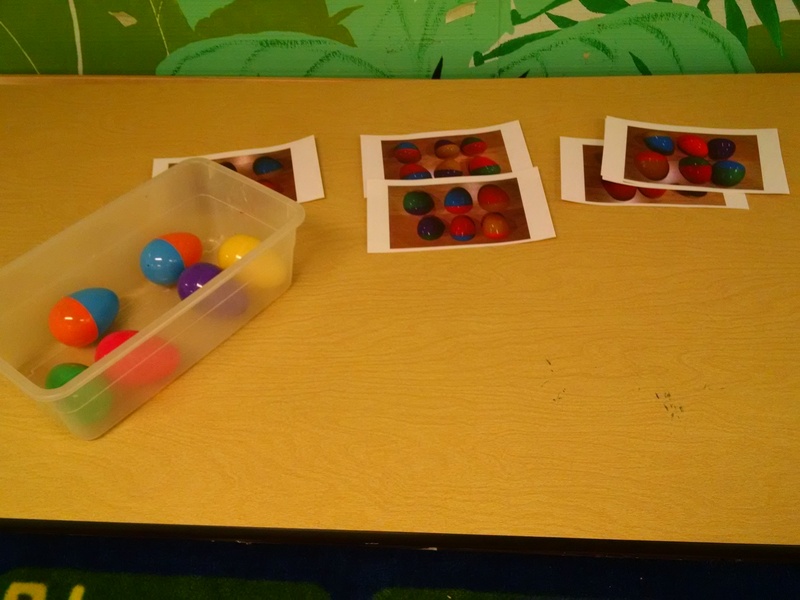 Science Learning: We made a collection of photos (all taken from the ZooBorns website) and printed them so on the back of each picture, there was either an egg, or an egg with a circle/slash through it. 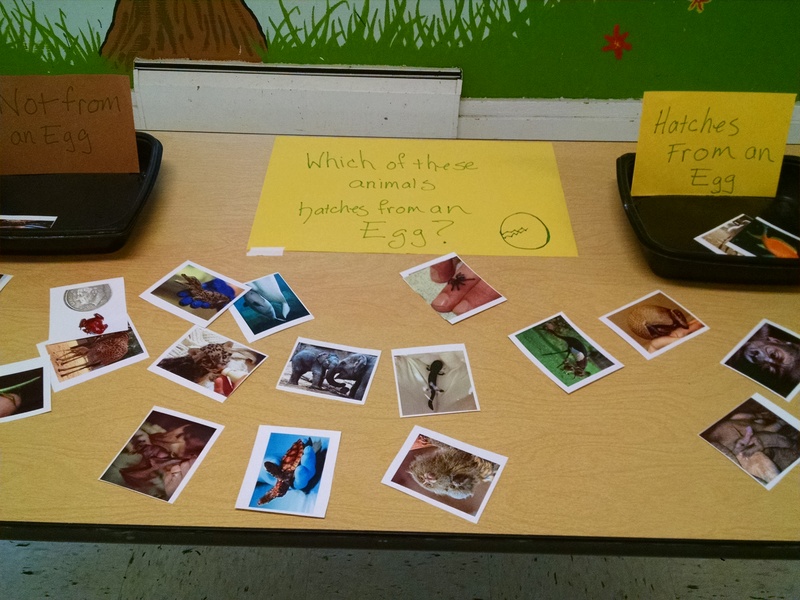 Then made a sign asking “Do these animals hatch from eggs?” There were two baskets: Yes and No. I’ve attached the file here so you can get a better look at it – but I don’t have copyright on these images, so encourage you to make your own set of cards rather than printing this one. Science Exploration: We made naked eggs in advance (see links at bottom of the post) and had one out in a bowl for kids to *carefully* explore. Next to that, we had a jar with an egg in vinegar so they could see the process that led to the naked egg. Next time, we’ll try shining a flashlight on the egg so they can see the yolk inside it better. 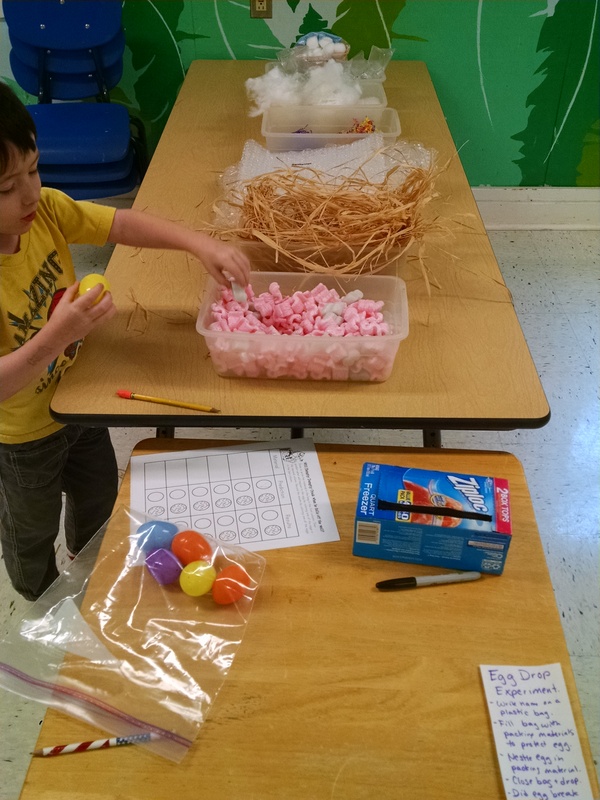 Sorting activity: Pair up halves of toy eggs so that their facial expressions match. (It’s not a terribly exciting activity for this age group, but if you happen to have a set of these eggs, it’s easy to set them out for kids to explore. Water table: You could put red water beads in the tub to simulate fish eggs floating in water. Gathering the Students. 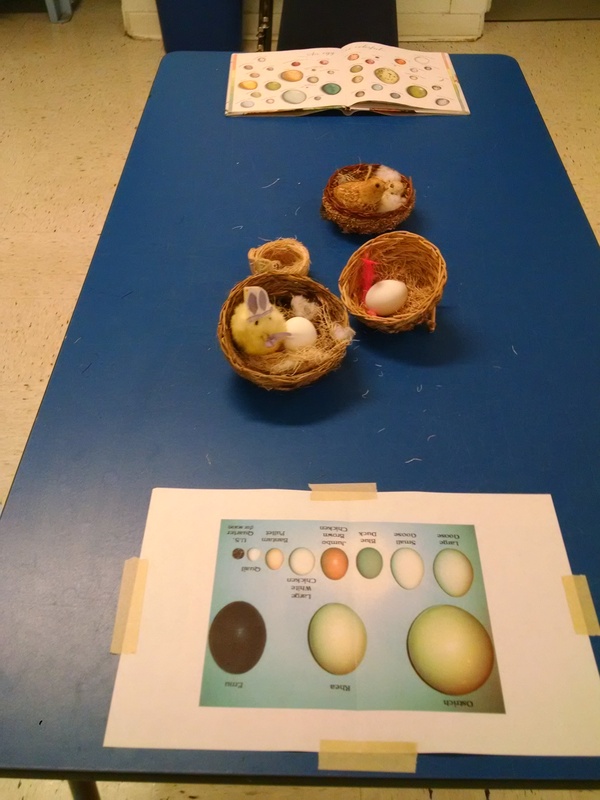 We used the unhatched egg idea from: Storytime Planners. Say: Make a noise like a rooster. (Crow) Make a noise like a hen. (Cluck) Make a noise like a chick. (Peep) Make a noise like an unhatched egg. (Silence) Good! And now you’re ready to listen to the next story! Song: I’m a little chick – tune of I’m a Little Teapot. I’ll spread my wings* (hands in armpits and flap) And cheep, cheep, cheep. Book: Choose one about all the different animals that lay eggs. Some to choose from, in order from my favorite to less preferred. (The first three are “guessing games” which is always fun in circle time. They cover several creatures with two page-spreads each: there’s a “teaser” page that shows a nice illustration and gives some clues, then it asks listeners to guess what is growing inside the egg. The next page reveals the answer. Guess What Is Growing Inside This Egg – “Their mother crawled from sea to land to bury these soft eggs in the sand. Can you guess what is growing inside these eggs? Sea turtles!” The reveal pages also have a paragraph of detailed info about that creature which 5 – 7 year olds might enjoy reading after circle. An Egg Is Quiet . Gorgeous naturalistic illustrations! “An egg is quiet. It sits there, under its mother’s feathers… on top of its fathers feet… buried beneath the sand. Warm. Cozy. An egg is colorful…” Great to put out on a table to enjoy, but not as engaging an option for circle time as the others. Lift the Flap or Felt Board: I printed out a poster with ten pictures on it, and covered each picture with a post it note, then shared this rhyme, which is adapted from one that Jen in the Library says came from Preschool Favorites by Diane Briggs. I changed a few verses, because I wanted to include more non-bird oviparous animals. There are ten little eggs / And what do we see / They’re about to crack open / “My goodness me,” said Mother Hen. The first egg cracks open. And what do we see? It’s a fuzzy, little duckling, looking at me. The second egg cracks open. And what do we see? It’s a pretty little robin, looking at me. The third egg cracks open And what do we see It’s a long-necked ostrich Looking at me. The fourth egg cracks open And what do we see It’s a hungry caterpillar Looking at me. The fifth egg cracks open And what do we see An orange and white clownfish Looking at me. The sixth egg cracks open And what do we see It’s a snappy alligator Looking at me. The seventh egg cracks open And what do we see It’s a wiggly tadpole Looking at me. The eighth egg cracks open And what do we see It’s a duck-billed platypus Looking at me. The ninth egg cracks open And what do we see It’s a little green dinosaur Looking at me. The tenth egg cracks open And what do we see It’s a little yellow chicken Looking at me. “My baby!” said the mother hen, as happy as can be. End with egg toss game. First, the teachers demo’ed it. Take a raw egg, carefully pass from one to the other. Take a step back, gently toss and catch. Take another step back, toss and catch, and so on. Once the teachers’ egg has broken, then have all the kids pair up and give them each an egg. We played on the grass, and our eggs were VERY sturdy. Some teams probably dropped their egg 10 times before it broke. We picked up all the shells to compost, but left egg goo there – animals will eat it. If it was summer and there were lots of barefoot kids running in the park, clean up as much goo as you can. The Odd Egg . All the other birds have laid an egg except duck. (The observant reader will notice it’s a male duck by its coloring.) Duck finds an egg and waits for it to hatch. Interesting page layout, fun read-aloud. An Extraordinary Egg . Too long for circle if you have kids under age 5, but it’s a fun story of a frog who finds an egg that turns out to be an alligator. The Chick That Wouldn’t Hatch . There are 6 eggs in a nest. 5 chicks hatch. The other egg goes for a long roll through the barnyard, past the pond, over the ditch, then finally hatches. The Cow That Laid an Egg . Marjorie the cow doesn’t feel special because she can’t ride bicycles and do handstands like all the other cows. The chickens hide a cow-spotted egg near her and say she’s laid an egg. Everyone is astonished. Eventually the egg hatches into a chick…. that says MOO!! Egg Drop . This book delights me. Truly. I chuckled while reading it. But I didn’t read it at class. “The egg was young. It didn’t know much. We tried to tell it, but of course if didn’t listen. If only it had waited.” It wants to fly before hatching, and in the end jumps from a great height which doesn’t end well. In the end, it’s a smiling sunny-side up egg next to some bacon waiting to be eaten. Again, I liked it. Many kids (including mine) would like it…. but some might find it disturbing. Egg drop. We had all the kids make bags of packing materials, nestle a hard boiled egg inside. First, they dropped from one foot off the ground. If it didn’t crack, then they dropped from two feet up, and so on. 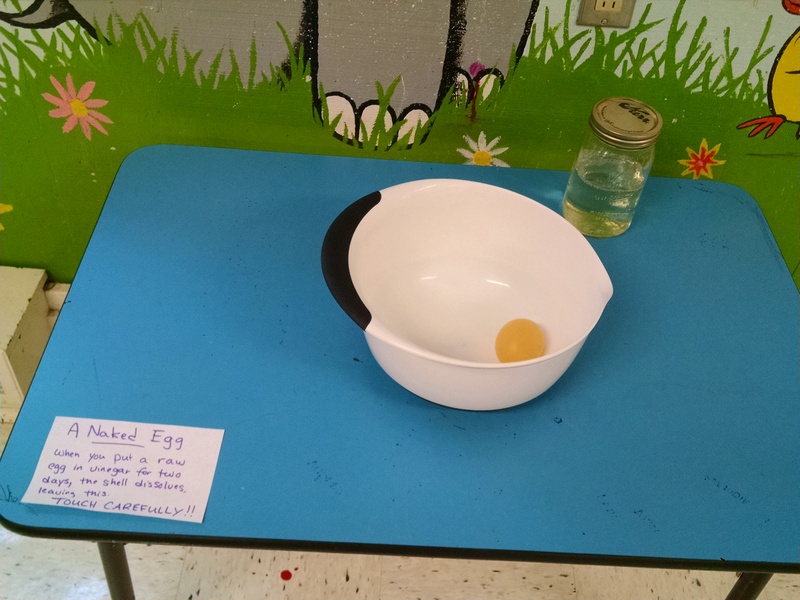 One kid made a packet that kept an egg safe up to 6 feet. Group Activity: Optional: Chicken Dance – Play the music and have the children do the classic dance: Make your hands like talking four times, flap arms like wings four times, wiggle bottom four times, clap Four times, do it again faster!! A Nest Full of Eggs. For kids age 5 – 7 (or younger if they have a long attention span), this is a nice engaging story of robins building a nest, laying eggs, hatching and flying away that also gives info about other birds, their feathers, and habitats. Where Do Chicks Come From? Even though this is supposedly the same reading level as the previous book, I find the scientific concepts are much more advanced, and more details than most of my kids would want. But if you have a scientifically minded kid who wants to know it all, check it out. From Egg to Chicken. A non-fiction review of the chicken’s maturation. A fine reference for a 6-7 year old who wants to learn more of the details. Hank Finds an Egg by Dudley. Sweet wordless story book about a teddy bear that finds an egg in the woods and tries several different ways to return it to its nest. The younger children in our class loved this story. How to Make a Bouncing Egg (Hands-On Science Fun) . A book that walks you through the process of making a naked egg (see below.) You don’t really learn anything you won’t learn by doing it. But, if you want a book about it, it’s available. A video… just for the goofiness of it: Check out this trifle.